The Halo Vault: Doubled Halos? This image was taken in Fukushima pref. in Japan, by Mr. Tasan (handle), May 5, 2006. There are two halos -- the lower one seems a 22 degree halo, but what is the upper one? I think it can be a 24 (or 23?) 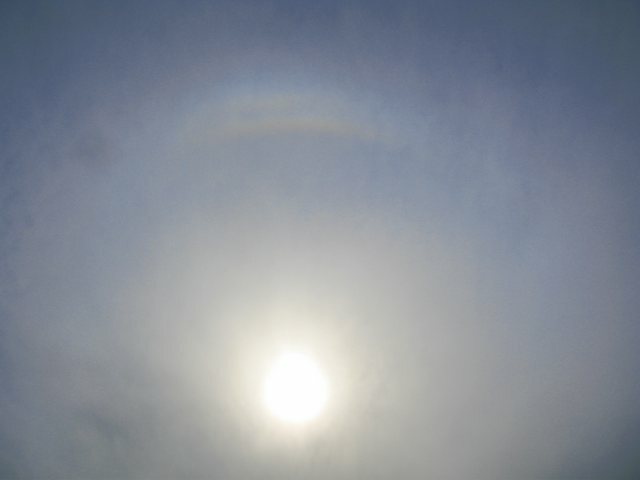 degree halo, a circular Lowitz arc or a 23 degree plate arc. What are your opinions? Interesting there I think by the looks of that diffuse arc I think its upper 23 degree plate arc. We should know solar elevation to say more about this halo (i.e. UT time of the photograph, and geographic coordinates). In the first instance, it looks like fragmentary 23 degs plate arc indeed, but suncave Parry arc, or upper Lowitz arc, seems also not to exclude. Were there other features outside the photographed area? Yeah, looks like a upper 23 plate arc. Parry or Lowitz would be expected to be sharper. The halo below can be either 23 halo or 22 halo. Pyramid crystals usually have such a large tilt that 23 halo is produced below 23 plate arc. But here it looks like there is bit of a pooly developed tanget arc look in the halo below, so I think it's 22 stuff. Knowing sun elevation might give us more definitive answer. Just when a next alleged 23 degree arc appears: checking the polarization of its inner edge can help to decide whether it is a 23 arc or a 22 Parry arc. For the 23 one, the polarization should be perpendicular to the scattering plane; for the 22 arcs it should be in the scattering plane. So keep your polarzers with you. Sorry for lacking information about solar elevation etc. The elevation is about 40-degree or little bit less. As Können point out, one way to check if the arc is 22° or 23° stuff is to check its polarization. However, polarization may be hard to see, so if you have digital camera and tripod, you can photograph polarization the shift of an halo. Remember to make notes about the orientation of the filter while turning it in front of the lens between photos. Do not use wide angle lens since the polarization shift may be too small to be seen in wide angle photo. I made an animation of 23° plate arc polarization in 6 May display. You can find the animation here. Polarization shift is not very big. Two photos were taken with Nikon digital SLR with 50 mm lens while turning polarization filter 90° between photos. It is true what Moilanen said. But from my experience, the test can be done with the polarizer before the naked eye - fast rotating from transmission axis horizontal to vertical. The eye is quite sensitive to see small shifts. The only real important thing is to check how the transmission axis is on the filters -- on a sunglass, it is usually vertical.